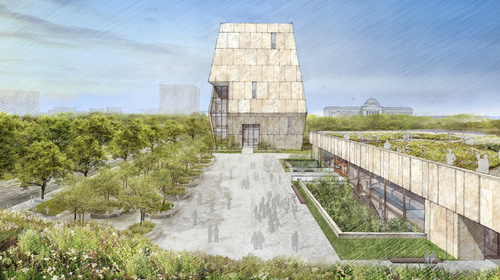 Saying he wants his presidential library to be part of a “living thing,” former President Barack Obama on Wednesday (May 3) unveiled plans for a three-building complex in Chicago, Illinois. The library—the 14th in the National Archives and Records Administration’s presidential system—is scheduled to open in 2021 in Jackson Park on the South Side of Chicago. The estimated cost will be at least $500 million. All funds will come completely from donations, but taxpayers will foot the bill for the center’s upkeep. The Obama Foundation said it will be the first completely digital presidential library; no paper records will be stored on site. "It's not just a building. It's not just a park. Hopefully it's a hub where all of us can see a brighter future for the South Side," Obama told an audience of about 300 political and community leaders at the South Shore Cultural Center. The center will encompass more than 200,000 square feet. It was designed by the New York-based, husband-and-wife architectural team of Tod Williams and Billie Tsie. "This has been a transformative presidency, and we will work to make a center that embodies and expands the Obamas' vision," Williams and Tsien said in a statement. "We look forward to collaborating with our partners, Interactive Design Architects, and to working with the South Side community." A museum, which will house exhibition space and education and meeting rooms. The tallest of the three structures—it will reach as high as 180 feet—will be designed with light-colored stone. Williams and Tsie said the museum will serve as a "lantern" for the complex. The forum building will house an auditorium, restaurant and public garden. It is also is being considered for a branch of the Chicago Public Library. The library, like the forum, is a single-story structure with a planted terrace. It will have classrooms and a learning center, and plans call for an adjoining studio for artists’ use. Obama hopes a vibrant park springs up around the center, where pathways weaving through the center would lead to nearby stores and restaurants, and areas in which people would barbecue and children can sled ride. The Obama Foundation said all of the buildings will be connected below grade and “clad in a lively, warm and variegated stone,” with glass openings placed to bring in natural light. The project aims to be certified at a minimum LEED v4 Platinum. Plans for the Obama Center in Chicago feature a presidential library, museum and forum, as well as pathways that lead to a neighboring park, community space, restaurants and stores. “The Obamas want to create a safe, warm, inviting place that brings people in, teaches them something new and inspires them to create change in their own communities. The Center will be a place for doing, not just looking or listening,” said Marty Nesbitt, chair of the Obama Foundation.